Tarts aren't just for Dessert! When it comes to Tarts, there's a world of savory options that are perfect for breakfast, lunch and dinner (and at 1am, when you're standing at the refrigerator in your pajamas looking for a snack). I've played with a few savory versions, including an array of Potato-centric pies (Custard-Style, Gruyere "Gratin", Tomato Jam & Mustard and Yogurt, Lemon & Dill) as well as a Thanksgiving Onion Tart. As with dessert Tarts, the possibilities are virtually limitless. This Onion and Leek Quiche Tart is more or less a riff on Quiche Lorraine. A simple Egg Custard is baked with Onions, Leeks, Smoked Ham and Gouda in a flakey Tart Crust made from Pate Brisee. The Tart Crust is blind baked (i.e. baked without a filling) to ensure that it is completely cooked by the time the Quiche Custard sets. Because of the delicate nature of the Quiche Custard, the filled Tart is baked at a lower temperature to prevent the Eggs from curdling. Filled with mounds of Onions and Leeks, gooey Cheese, smoky Ham and, when baked properly, a delicate Quiche Custard, this Tart is a perfect brunch item. Unlike dessert Tarts, which work well when made from flakey Pate Brisee, sweet Pate Sucree, crumbly Pate Sablee or even Puff Pastry, savory tarts are a bit more limited. For this recipe, Pate Brisee is recommended. For an 8"/9" Tart Shell, you will need approximately 240g of dough (a half recipe), but consider making a full recipe as the dough refrigerates and freezes well. Prepare and blind bake the Tart Shell at 350 degrees Fahrenheit (177 degrees Celsius) until it is golden brown - approximately 30 minutes. Do not dock the Tart Shell before baking! The Quiche Custard is very liquid and will leak through dock marks. In fact, you will want to closely inspect the blind baked Tart Shell for any cracks or holes, patching them with any leftover dough or small bits of Cheese. Set the baked Tart Shell aside to cool. It can be blind baked in advance and stored at room temperature for 2 - 3 days wrapped in plastic wrap. 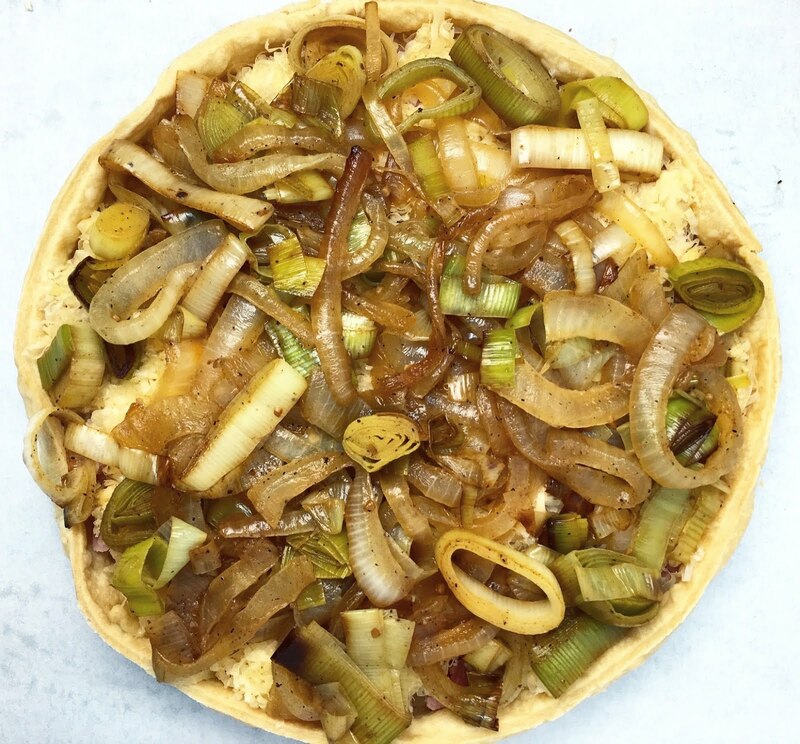 The Onions and Leeks are partially cooked before they are baked in the Tart Shell. Carefully wash the Onion and Leek. A surprising amount of dirt gets trapped inside a Leek as it grows, so clean it well. Cut the Onion and Leek into 1/4" slices. Gently heat the Onion and Leek slices with the Butter, Salt and Nutmeg in a pan over medium heat. 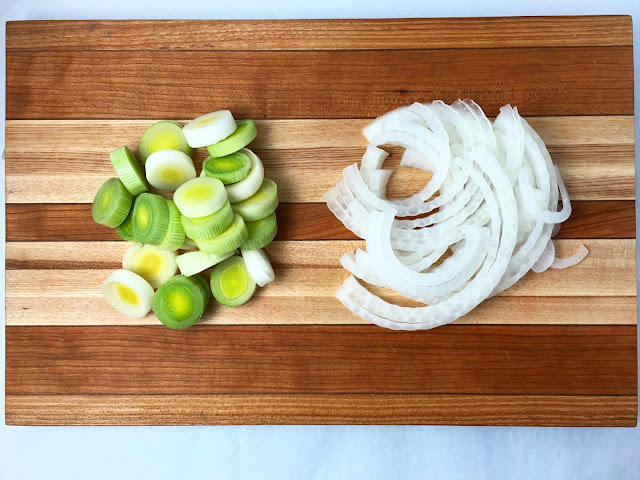 Sweat the Onion and Leek slices until they are soft and begin to turn translucent. Remove the pan from the heat and set the Onion and Leek slices aside to cool. I always love the combination of Ham and Cheese. Who can resist the perfect marriage of gooey and salty? 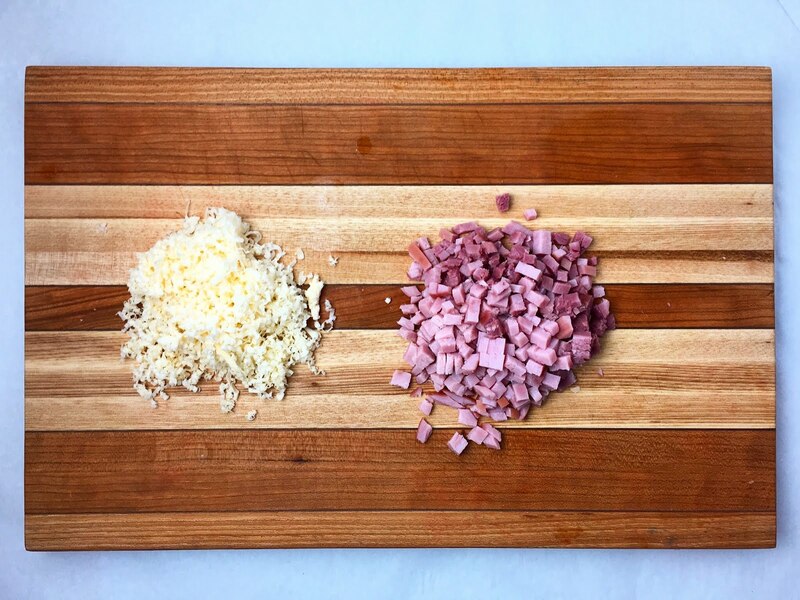 Finely grate the Cheese and small dice the Ham. The last component is the actual Quiche Custard, a simple mix of Eggs, Cream, Milk and seasoning. Do not under-season the Quiche Custard, or else you will have a bland final product. Mix the ingredients well but gently using a whisk. All of the ingredients should be well combined, but you do not want to trap air in the Quiche Custard. Trapped air will expand during baking and cause the Quiche Custard to soufflé (i.e. rise and inflate). To help eliminate any bubbles, pass the Quiche Custard through a sieve. Assemble the Onion and Leek Quiche Tart in layers. Begin by covering the bottom of the Tart Shell with the grated Cheese and diced Ham. Cover that layer with the cooled Onion and Leek slices (you may not need all of the Onion and Leek slices). Transfer the Tart Shell to the oven. It is much easier filling the Tart Shell at the oven rather than carrying it when it is full of the very liquid Quiche Custard. Slowly fill the Tart Shell with the Quiche Custard, paying close attention for any leaks. Because of the delicate nature of the Quiche Custard, the Tart is baked at 300 degrees Fahrenheit (149 degrees Celsius). Higher temperatures would cause the Eggs to curdle. Some recipes involving custards recommend even lower temperatures, but the amount of Cream and Milk in this recipe makes it possible to bake the Tart at a slightly higher temperature. Bake the Onion and Leek Quiche Tart until the Quiche Custard has just set and does not jiggle when moved - approximately 30 minutes. Do not over-bake the Tart, or the Quiche Custard will become rubbery and may curdle rather than remain soft and creamy. Allow the baked Onion and Leek Quiche Tart to cool for at least 10 minutes before serving. The Tart is best served shortly after it is made, but it can be kept refrigerated in an airtight container for 24 hours (the crust will become soggy with time). Gently reheat the Onion and Leek Tart in a 300 degrees Fahrenheit (149 degree Celsius) oven for 7-10 minutes before serving. Do not freeze the baked Tart. A smoked Ham is recommended for a strong flavor. Since Ham can be very salty, you may wish to cut any added Salt in the recipe depending on the Ham that you use. Select a soft Cheese that melts well such as Gouda or Gruyere. 1. Form and blind bake the Tart Shell using Pate Brisee. Check the Tart Shell closely for any holes that could leak when filled. Patch any holes with leftover dough or a small piece of cheese. Set the Tart Shell aside to cool. Chef's Note: Do not dock the Tart Shell before blind baking. The Quiche Custard Filling is very liquid and will leak through even the smallest holes. 2. Wash and cut the Onion and Leek into 1/4" slices. Gently heat the Onion and Leek slices with the Butter, Salt and Nutmeg in a pan over medium heat. Sweat the Onion and Leek slices until they are soft and begin to turn translucent. Remove the pan from the heat and set the Onion and Leek slices aside to cool. Chef's Note: Take extra care to clean the Leek very well. A surprising amount of dirt gets trapped in the leaf portion of Leeks as they grow. 3. Preheat the oven to 300 degrees Fahrenheit (149 degrees Celsius). 4. Prepare the Quiche Custard. 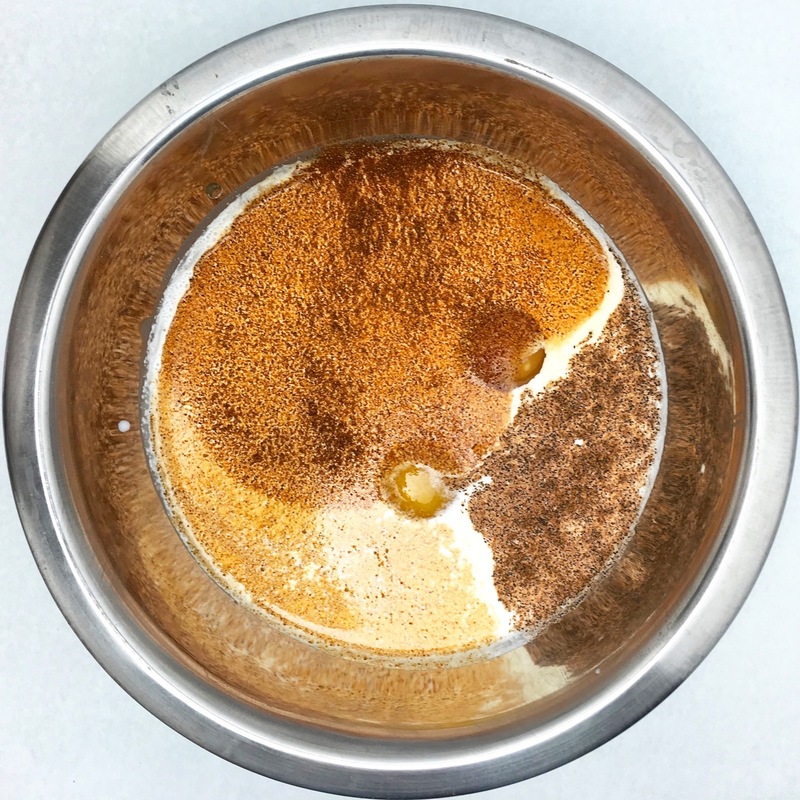 Combine the Eggs, Cream, Milk, Salt, Pepper, Paprika and Cayenne in a mixing bowl and whisk gently to combine. Strain the Quiche Custard through a sieve to remove any air bubbles. 5. Evenly distribute the Ham and Cheese at the bottom of the Tart Shell. Cover the Ham and Cheese with the cooked Onion and Leek slices (you may not need all of the Onion and Leek slices). Transfer the Tart Shell to the preheated oven and carefully fill the Tart Shell with the Quiche Custard (you may not need all of the Quiche Custard). 6. Bake the Onion and Leek Quiche Tart until the Quiche Custard has just set and does not jiggle when moved - approximately 30 minutes. 7. Allow the Onion and Leek Quiche Tart to cool for at least 10 minutes before serving. 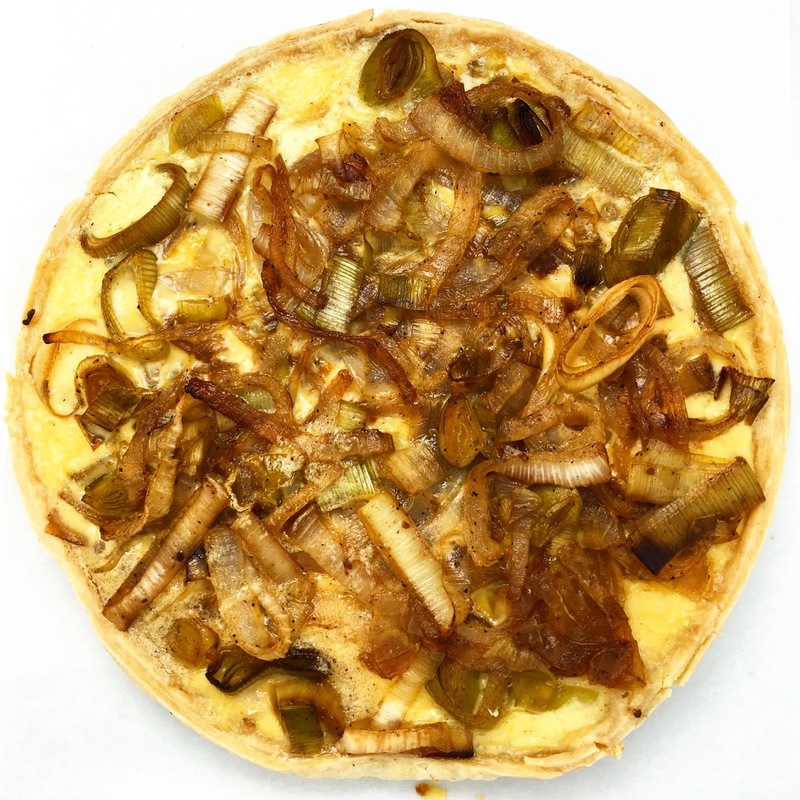 - The Onion and Leek Quiche Tart is best served shortly after it is made. - The Onion and Leek Quiche Tart can be kept refrigerated in an airtight container for 24 hours, but the crust will become soggy with time. 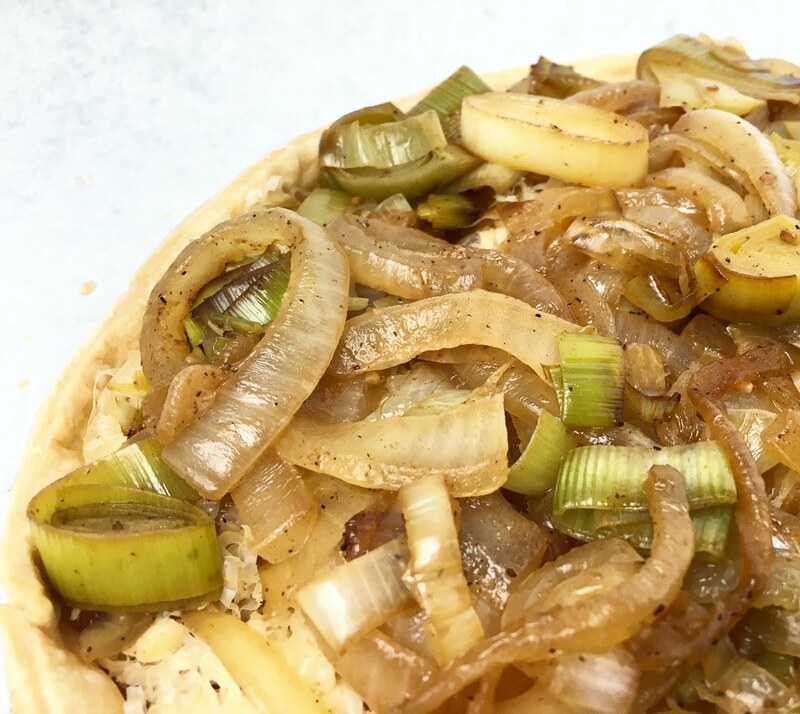 Gently reheat the Onion and Leek Tart in a 300 degrees Fahrenheit (149 degree Celsius) oven for 7-10 minutes before serving. 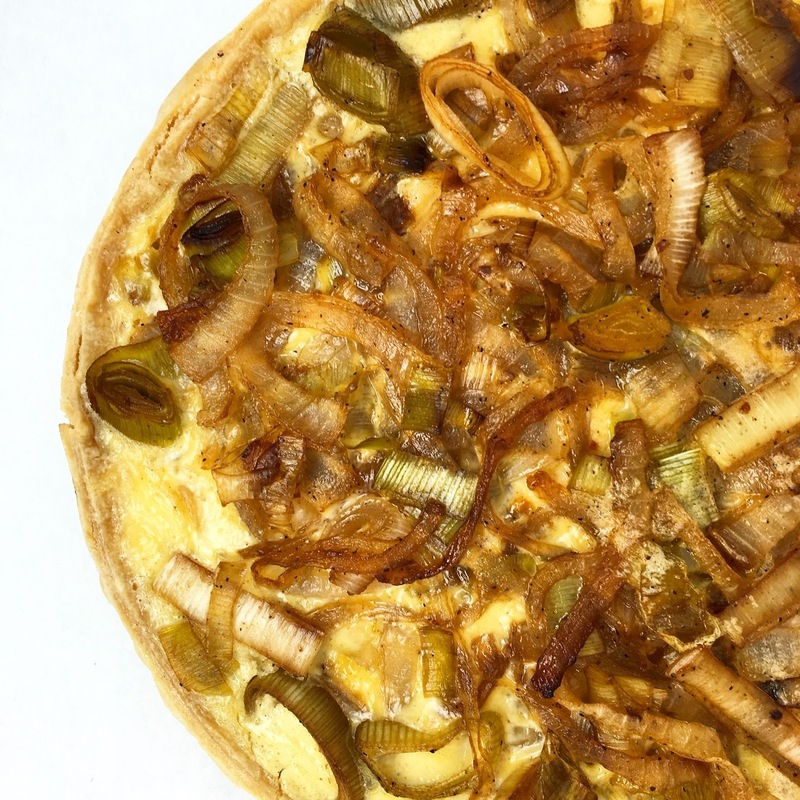 - Do not freeze the baked Onion and Leek Quiche Tart.